There tends to be a pattern in video reviews. This one from the Travel Mom Emily Kaufman is a little different. Instead of pretty shots of the ship mixed with commentary from the reviewer, Kaufman interviewed fellow passengers. The interviewees were enthusiastic and provided a series of glowing reports on Princess's food, destinations and services. The video is hosted on Princess Cruises' YouTube page, so we assume the company had a part in the production and only included positive comments. But even with that caveat, this was well done and does show how loyal passengers are to Princess. It also brings a new element to the video review, which is always welcome. Size does matter. As the major cruise lines build bigger and bigger ships, they are leaving behind passengers who want an intimate experience and leaving behind destinations that cannot handle thousands of passengers at once. Consider Alaska for a moment. Despite hundreds of options every summer, none of the big ships can disembark in Glacier Bay. A small line like Un-Cruise Adventures can. That line -- featuring small ships without the glitz -- served as the subject of this interesting Wall Street Journal review. On Un-Cruise passengers still get excellent food and top-notch service. But instead of a post-dinner show or gambling, they are more likely to hear a talk on the next day's stop. As much as they try to cater to everyone, the big cruise lines cannot offer what the small ships can. Fortunately there are more companies popping up to fill the void. The companies enable people who want to see a different side of a destination -- like Alaska -- in a different way. For a new ship, there are already plenty of reviews for the Viking Star. But no site cuts to the chase like Cruiseline.com and now they have reviewed the Viking Star. Written by Sherri Eisenberg, the review touches all the known talking points about the new cruise liner...beautiful design, no nickel and diming, incredible spa, etc. What's unique and helpful about Eisenberg's review is her bluntness about who the real market is for Viking's first ocean ship. This ship is not for families. Viking knew they were going to be able to tap into their river cruise customers to fill this new ship. Yet one of the main goals of their expansion was to reach a demographic beyond their current base. If the reviews are right, it is still going to take time. Not only is the ship still lacking activities and amenities for families, but it is also missing the night-life and experiences targeted at young singles or young couples. Cruiseline and Eisenberg are overall very positive about the Viking Star. But as people do their research, it is good to know the experience is not for everyone. Last week a 10-year-old girl drowned on the Norwegian Gem. The tragedy restarted the debate on cruise lifeguards. As Cruise Law News noted, this is the seventh drowning-related incident on a cruise ship in the past two years. Because of the tragedy, cruise customers and concerned parents tend to react the same way: add lifeguards. However, lack of lifeguards are only part of the problem, and even with multiple steps to improve safety, no cruise ship will ever be 100% safe. Thousands of people will drown this year. They will drown in pools, lakes, the ocean, wherever there is water. Many will drown right in front of a lifeguard. Lifeguards are a preventative step, but no one can keep every swimmer safe. It only takes a minute for something to go wrong and depending on reaction time, a lifeguard can be too late. Would a lifeguard have made a difference on the Gem? Who knows. The pool was very crowded and relatively deep. All parents have to watch their children at any pool, but certainly one without a lifeguard. Why don't cruise ships have lifeguards? Even though they don't eliminate drownings, there is no reason all the major cruise lines shouldn't have lifeguards. Like many decisions, it is probably based on cost and perception. Lifeguards have limited utility on a ship where every worker tends to where multiple hats and can be used throughout the day. But also adding a lifeguard might make the parents become less engaged. They might think someone else is watching their child, so they don't have to pay as much attention. There is also the legal liability. When a cruise line adds a lifeguard it is somewhat implied that the guard is now responsible, instead of the passenger. Still, none of these costs or legal issues really justify not having lifeguards. As the lawsuits pile up from drownings, we predict that every big ship will soon have lifeguards. The insurance companies will insist. The most interesting aspect of the Cruise Law News report where some of the eyewitnesses explaining how passengers with medical training were not able to help. This is an even more complex legal issue. We are now in such a litigious time that cruise companies probably fear what any passenger might do to another in a time of crisis. A passenger who helps someone drowning or choking or having a heart attack, could be well intentioned, but the cruise staff is unable to check backgrounds or skills. Especially in the heat of the moment. It is a shame that good help might go to waste, but until the cruise companies can get some Good Samaritan clauses that hold up in court, it seems like it is best for everyone if the cruise employees handle emergencies. If your a cruise history fan, then Monday the 25th was a special day. 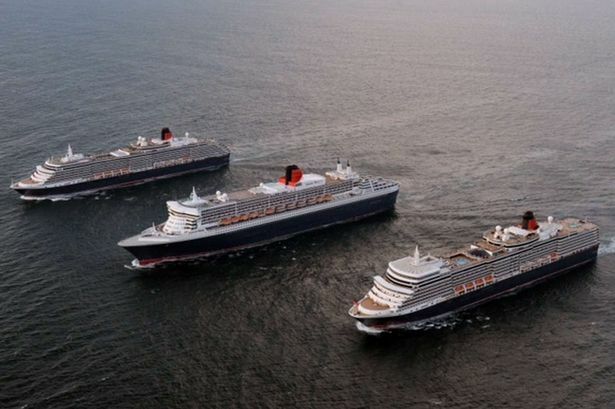 Cunard's three Queens -- the Queen Victoria, the Queen Mary 2 and the Queen Elizabeth -- sailed together in Liverpool. As part of the ongoing celebration of the company's 175th anniversary, the ships coordinated a "dance." Thousands cheered along the River Mersey and the Royal Air Force provided a flyover. There is extended coverage in the video below. While Cunard's product might not appeal to everyone, anyone who loves cruise should appreciate their contribution to the industry. Even as ship designers get more and more creative, inside cabins are not going away. While they often lack for size, balconies or any view altogether, there is still great value in the rooms. Cruise Critic provided this helpful assessment of all the various inside cabins available. Some shine and others do not. In our experience, the Disney Inside Cabins are a great offering. They're spacious and the "virtual" porthole gives the semblance of a view with a Disney twist. If you're someone who spends the whole day outside the cabin, an inside option might make sense. Now, more than ever, there is so much do to onboard, who cares about a view or a few extra square feet? No cruise line ever wants their ship stranded anywhere. And most passengers certainly don't want to be stuck, but everyone associated with this week's semi-stranded sailing on the Norwegian Dawn seemed to have a great time. Despite striking a coral reef near Bermuda Tuesday, the ship still made its return to Boston on time. Passengers still got to enjoy the island and the ship was fully functional throughout the temporary repairs. Customers also gave high marks to the captain for how he handled the delay and for his clear communications. Accidents at sea are very serious and potentially very dangerous, but this is the type of event that NCL and the industry should highlight. Even with a totally unplanned delay, the vast majority of the ship felt self and had a great time. Now you can see how many people -- passengers and crew -- got sick on your ship. The database also includes crimes, so that you can be aware of what has happened and what may happen again. Cruise Control also provides safety records so that you know if there are any reoccurring issues that might impact you on your trip. Cruise Control only tracks back to 2010 and is also somewhat limited by the amount of illness and crime actually reported, but this effort is a good start. By having a central location, hopefully the data collection and shared data will improve. Overall cruises remain a very safe vacation, but that doesn't mean you shouldn't do your homework and that the cruise companies shouldn't be held to a high standard. Congratulations to @viking_cruises on the christening of Viking Star and thanks for the coin! I'm stuck at my desk today, but daydreaming of this while I work. 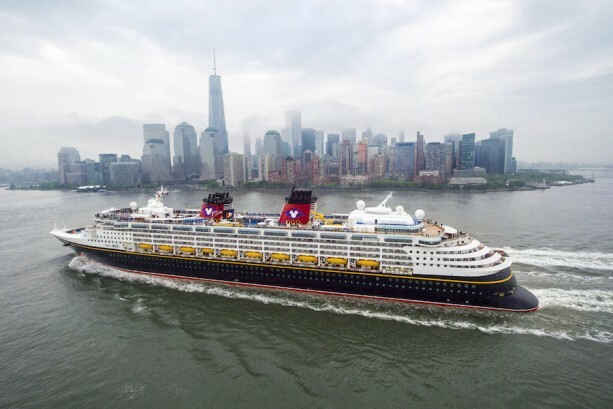 Disney Cruise Line returns to Big Apple; Could New York support year-round Disney Cruising? Disney Cruise Line unveiled their 2016 itineraries and announced a return to New York City. From the Big Apple, Disney will sail to the Bahamas and Canada. This obviously has Disney Cruise fans excited, but to us, raises an important question: could Disney sail year round from New York? The short answer is "yes," but there are some obvious challenges and a few big opportunities. Can the New York Market support it? New York is a growing cruise base with more and more companies adding departures. The local population alone is huge and when you add in drive market and air access, it can certainly support even more cruise traffic. NYC is already a big customer base for DCL and Disney's other vacation destinations, so the company could easily tap into a welcoming group of potential passengers. What about "offseason" weather? The big test for the 2016 return will be demand in October for the Canadian cruises. Is there enough interest for similar, colder destinations when most families are in school? Or perhaps there will be overwhelming demand for offseason trips to the Bahamas as New Yorkers try to escape the cold. Does Disney have enough ships? All the lines that sail year-round from the New York area have twice or three times the fleet that Disney has. Because the fleet is limited and the demand is so high, Disney has to be selective where they sail. Disney could make year-round sailing from New York work tomorrow if they wanted to try it. However, the company can only be in so many places at once. Until they have a bigger fleet or face over the top demand, year-round New York sailing will have to wait. We like to feature the best cruise reviews we can find, so we were due to highlight another effort from Popular Cruising. In this video, Jason tours one of Carnival's most popular ships, the Carnival Breeze. Like all Popular Cruising videos, this covers all aspects of the ship but presents the overflowing detail at an even pace. Other cruise companies are getting plenty of attention with new launches or new orders, but as this review shows, Carnival's ships and experiences remain very innovative and very fun. After years of all the same ships seemingly sailing to all the same ports, there is a new Alaskan port this summer. SilverSea will stop twice this summer in the small Alaskan town of Yakutat. There is no cruise dock, so approximately 120 guests will tender to town to get a slice of Alaskan life experience. There won't be the usual Alaska excursions because the town is not ready for them. This is the first time they've allowed any modern cruise ship to visit. Instead the passengers will get to see some local performers, tour a fish processing plant or see some local wildlife. Yakutat took these baby steps with SilverSea after avoiding cruise lines for decades. Now the changing economy and the need for economic diversity and tourism dollars has the town open to the idea of cruise passengers. In addition to the two stops this summer, there are also two planned for 2016. If those prove popular and profitable, you can expect more stops in the future, bigger ships and likely a full cruise dock. Cruise passengers often get a bad reputation with tourism boards. The stereotype is that they are boorish, don't spend enough, boom into town and then leave. We know that is not true and the people of Yakutat will find that out this summer. This is the start of growth in their city and the chance for SilverSea to offer an exclusive destination. This week Royal Caribbean announced a change in their tipping rates. Starting June 1, the daily rate per guest will rise to $12.95 in standard accommodations, and $15.95 per guest in suites. If you prepay before June 1, you can still use the current rates of $12 and $14.25 per day (respectively). The company explained this was to reward their excellent staff and that all tips are pooled. While this seems noble on the Royal Caribbean's part, Cruise Law News isn't buying it. Jim Walker explains that a portion of all pre-paid gratuities bypasses the crew altogether and goes directly into Royal Caribbean's bottom line. All of this is part of the changing cruise industry and experience. As the customer base becomes more global and diverse, more passengers hail from countries where tipping is not common. Also people carry less cash and want to "charge" more, so offering pre-paid gratuities or gratuities that are added to the overall bill is a convenience factor for many. Our suggestion is that if you think a automatic gratuity is unfair (either in cost or how it is pooled), then opt out and pay directly. This can be done through most purser's offices and the crew members can then decide how they want to pool the cash you gave them directly. Regardless of how you handle Royal Caribbean's and other cruise company policies, just remember to take care of the people who take care of you. Both USA Today's Cruise Log and Cruise Fever posted numeric lists highlighting Viking Cruises' new Viking Star. Both lists highlighted the ships beauty and design, but most new ships look great. What makes Viking unique will be their approach to destinations and how they handle the "extras." Instead of just docking in a port and letting cruisers fend for themselves, Viking is taking a more-river focused approach to their destinations. The ship will have a variety of resources and speakers to educate customers on their ports, sharing the history and culture of the cities. Viking also plans on longer stays in port so that customers can spend more time exploring and experiencing the great destinations. The other aspect of the Viking Star that has its inspiration from river cruising, is the number of services and amenities that are included in the price of the cruise. Room service? Included! Wifi? Included! Beer/Soda/Wine? Included. Viking is a luxury, high-end product. They could make more money by charging for these extras, but instead they want to present value -- even at the high-end. We hope it works and we hope customers appreciate the decision. Since their launch Disney has been fighting perception that their cruises are just for families and children. They're not. Adults can have a great time too and avoid kiddie activities with all the private, and adults-only features on board. Here is a helpful video review from Daily Mail. Continued violence in the region forced most of the major cruise lines to cancel or alter stops in the Mexican city of Puerto Vallarta. Both Royal Caribbean and Celebrity bypassed their respective stops this week. Both ships scheduled for the port added an extra day at sea. As of Monday, Carnival was keeping their stops in Puerto Vallarta, although they were limiting excursion due to safety concerns. Disney also announced they would bypass Puerto Vallarta this week and explained the change via letter to each cabin. The Disney Cruise Blog has the letter. In the letter Disney explains their concerns and reminds the passengers that their final bill will be adjusted with regards to port fees, taxes and cancelled excursion. Cruise companies always worry about passenger safety, however, given the passengers killed in March due to violence in Tunisia, the companies are rightfully cautious now. Royal Caribbean just launched their second Quantum-class ship in the Anthem of the Seas and is not stopping there. The company announced that they will build a fourth Quantum-class ship. This is really no surprise given the instant popularity of the new ships. Like the previous Quantum ships, the new liner will be built with Meyer Werft in Germany and ready in 2019. The Royal Caribbean Blog picked up from analysts reports that the new ship could be based in the North American market. As much as the Asian market presents a huge opportunity for the new ships, demand for the "wow ships" in the American market might be too much for Royal Caribbean to ignore. The Wall Street Journal provided a good breakdown of some of the most popular river cruise companies and what each has to offer. All the well-known lines have similar routes and stops, but the WSJ, with the help of Wendy Perrin, highlights the right river cruise for foodies, photographers and those who want a luxury experience. The river cruise experience is still very different from the large ocean liners, but as the industry grows the river cruises will become more diverse in their offerings and experiences. It is a great time to sail. #CruisingTips - As a precaution, always know where the onboard medical services are located. Safety first! The Orlando Sentinel posted a good article on the cruise ship water slide arms race. One Florida company, Aquatic Design & Engineering worked closely with Royal Caribbean on the concept and design of all their new slides. Although Aquatic Design & Engineering says the goal was to "provide that sense of danger and excitement," ultimately it is about fun. The slides are never as extreme as some of the other onboard attractions. We're sure that all new ships built for families and young cruisers will have slides. What will be fun is to see what older ships add water attractions like Disney did with their AquaDunk. Silver Cloud transiting the Corinth Canal. How does an 89-night cruise sound? Doesn't the typical seven-day cruise always seem too short? If you have three months to spare and more than $54,000 lying around, Seabourn has a deal for you! The luxury line announced a diverse and exotic 89-night cruise around the Pacific. The 2017 itinerary starts in Singapore, hits dozens of major Asian ports, crosses the Pacific and wraps things up in Seattle. Smaller segments of the trip will be available for booking. 2017 will be a big year for the luxury liner. As Haute Living reminds us, Seabourn will also debut their new ship the Encore, as well as new Caribbean options for passengers who want one of the most unique offerings at seas. Huffington Post put up a good overview on how to select the right cabin for your next cruise. The article touches on the major factors like view, noise and location. The only area that they didn't focus on enough is size of the cabin vs the number of people sharing the cabin. Nearly every cabin at sea is comfortable for two people. However, add a third or more and things start to feel crowded quickly. If you are going to add multiple people to one cabin, be sure you have enough space or that your expectations are set. As we predicted, more ships are adding room service fee. As USA Today reports, Norwegian Cruise Line will now include the $7.95 on all 13 of their ships. Certain cabins and suites will be exempt from the charges and all passengers can still order coffee and a continental breakfast to the room for free. Norwegian explained their April test was successful, hence the rollout to the entire fleet. If their test proved valuable, we predict the other cruise companies' tests will also be a success. Room service fees are here to stay. As Cruise Industry News reported, Cunard and the Royal Baby had perfect timing. All three of the venerable British company's ships were headed to Southampton to celebrate the line's 175 anniversary, just as the William and Kate's baby was being born in London. To honor the newest Royal, the three ships coordinated a solute of their whistles and foghorns at noon on May 2. The ships will now start their summer sailing and will be far, far enough away that their future horns won't wake the sleeping princess. That didn't take long! Royal Caribbean's Anthem of the Seas just debuted to the public a little more than a week ago and already there are plenty of video ship reviews. Here are a few of the better new ones from passengers who sailed out of Southampton. Labels: Anthem of the Seas, cruise reviews, Royal Caribbean Anthem of the Seas, Video Reviews, Youtube, Youtube reviews.